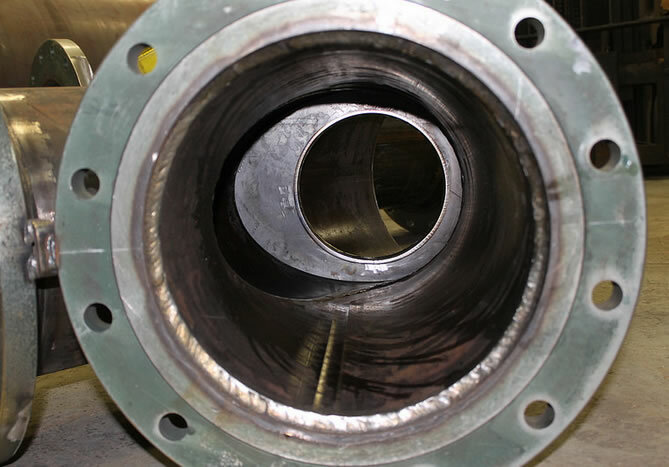 Case Study - SSI Fabricated, Division of Steam Systems, Inc.
SSI Fabricated, a Division of Steam Systems, Inc. fabricates a wide array of ASME Certified strainers and pressure vessels. SSI Fabricated specializes in custom fabricated vessels for a variety of applications and has been in operation since the early 1990's. 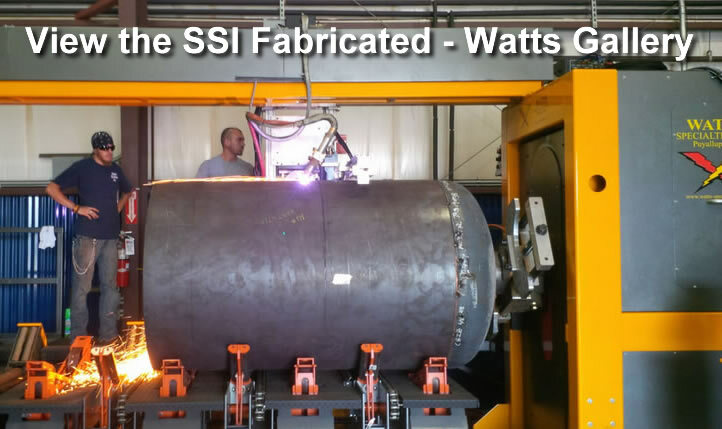 SSI Fabricated is located in Middletown, Ohio where they have a 17,000 sq. ft. shop with 18 full-time employees. 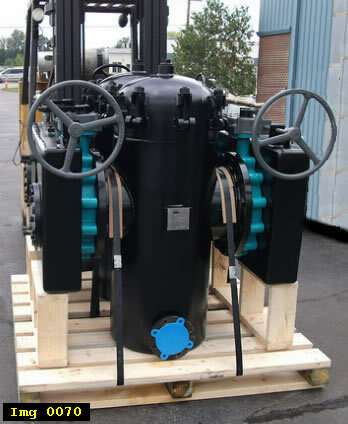 This project included building 48" steam separator vessels with 24" inlet/outlet nozzles, custom designed for a Utilities Plant. This project included a requirement for SSI to provide ASME Certified "U Stamped" vessels. In our Project Gallery below it is clear that SSI provides high-quality fabrication, ASME stamped for consistency and quality control. "We have only been using the Watts-Mueller W-484 System with PypeServer Software for just over 8 weeks," said Branscum. "I would estimate that we are saving around 160 man hours per week since getting the Watts System. That is equivalent to 4 pipe fitters, and we may be saving more time than I have estimated." "We are still finding out what we can and cannot do with the Watts System," continued Branscum, "but for the most part our Watts-Mueller machine will handle 2" thru 48" pipe or rolled plate - this gives us plenty of room for savings on almost any project. We have already increased our production and accuracy with cutting and beveling our components. We have communicated the prospect of increased future production to our customers - they are really excited with the possibility of increased production and shorter turn-around times. Watts-Mueller equipment helps us increase productivity which means fewer workers standing around with nothing to do." "The software makes the task of laying out everything by hand virtually effortless - fewer mistakes are made when you can see your 3D model. I have a couple of young guys right out of high school who are really into it. They picked up the software fast and love how they can make a couple of clicks with a mouse and turn out the same or better part than a 30 year veteran." 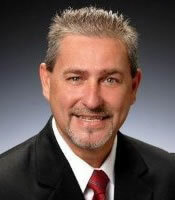 David has over 25 years of experience with industrial manufacturing and fabrication. He started right out of high school at age 17, doing fabrication in the field. After working in a shop for several years, David returned to school, earning a degree in Business. David worked for SSI from 1992-2000. After a few years pursuing other opportunities, he returned to SSI in 2011 in his current management position. David is in charge of all fabrication, maintenance and building of equipment for the company. Can You Comment on the Quality of the Cuts and Saddle Joints Using Watts-Mueller Equipment? "If you look at Image-0878," [image pictured to the right] said Branscum, "you can see a saddle joint. Fabricated manually, it would take us 2 hours of layout on each cut, then 5 hours in welding time which equals 9 man hours." "Using the Watts-Mueller System drastically cuts the job labor time. The 3D software draws up the cuts, then the Watts machine cuts it. We can now complete the cuts for this saddle joint in 1 man hour, thus cutting our labor time for layout, cutting, fit up and welding time by 34%." "We produced several skid units [Img 0070 to the right] recently prior to having our new equipment and system online. My estimates from what I have seen with our projects using the Watts-Mueller system, we would have saved around 100 manhours on each of these skids. Our increased productivity is going to bring us more profitability. We have cut fitter time in half...at least...it literally takes minutes on the Watts-Mueller machine." How Easy has it been to Use the Watts-Mueller Equipment? "We started using the Watts-Mueller 484 with the PypeServer software in July 2014. Here we are doing this interview on September 9 and we are using the Watts-Mueller system on 98% of our work. I took one other guy to Seattle for 2 days of training. We set the machine up in our shop and had the Watts guys here for an additional two days to help us get it properly set up and a bit more training." 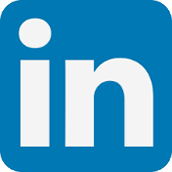 "The learning curve for PypeServer software is fairly easy. Watts-Mueller has great documentation and excellent tutorials to help when we run into an issue. When I need help, or have questions, I can get someone on the phone. It is obvious that they listen, are responsive, and work to give us support. This might seem small, but the idea that I can call Watts-Mueller and get quick technical help is really important. These guys have been phenomenal!"